Performance Time: Approximately 60-90 minutes, 57 pgs. CHRISTMAS MUSICAL. When three magi notice a star announcing the birth of a new king, they load up their camels and set out across the desert bearing gifts. 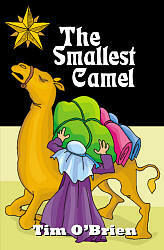 Sammy, the smallest of the camels, yearns to go along on the journey but due to his small size is left behind. Determined to see the new king, Sammy secretly follows the caravan into the desert. Along the way, Sammy proves that though he may be the smallest camel, he has the biggest heart. This light-hearted, uplifting musical features 11 original songs and will charm audiences with its warm Christmas spirit and message of hope and goodwill.